Tonight is supposed to be "date" night in our house. David, my husband, has been planning on a night out for weeks and I think cabin fever is an understatement. He does deserve a night out, especially after last weekend when he basically watched our 3 boys and the 3 neighbor boys alone while I was at class and dress shopping with my Mother and Grandmother. I am not sure what he wants to do. He's talked about going bowling, playing pool, or attempting to play some slots at the casino. Those were okay until he mentioned helping a friend this afternoon. His friend is in the process of remodeling his kitchen, but the cabinets he wants to use are in an old abandoned farmhouse. They have gotten permission to tear out the cabinets and anything else we want from it. 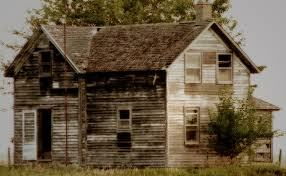 My husband should have known not to mention this, because now all I want to do is go explore the forgotten house. I want to look at all the light fixtures and old outlets. I want to see what kind of windows are on the house. I want to dig through dust and cobwebs for little treasures. I want to knock down plaster walls! Date night suddenly seems to take on a whole new excitement for me. I enjoy getting out and having David dote on me, plus I get to take a break from always being the caregiver and referee for a few hours. BUT, now I want to go play in the old disappointed house. I love old disappointed houses. You see their gray skeletons dot the landscape- neglected and leaning. I can't help to wonder what hopes and dreams those houses represented for the people who built them. 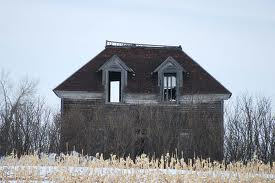 Nobody pictures their homes or dreams crumbled amongst dried cornstalks or the poster child for a Ghost Hunters episode. Now they stand year after year, as the only evidence of the people who once dared to plow the earth and dream about a better life. Every time we drive past one of these remnants, I tend to clammer on and on about them until I drive my boys nuts. One of my favorite authors, Lucy Maud Montgomery, wrote a series called EMILY OF NEW MOON. I can't recall if the "disappointed house" came from the book or the television series, but that is the best description of these houses. Disappointment is what these houses represent. No one would build a house with no plans to live there. All those farmers' hopes and dreams were built into those houses. Each nail driven was a step closer to the farmer's goal. I can imagine a man being energetic and positive as he squared the corners and pieced the frame. He may have boasted about his parcel of children playing, running, and squealing inside those now empty walls. Neighbors, in good Nebraska fashion, would surely have been there helping and sweating alongside the farmer in his efforts. They poured their sweat, tears, and efforts into their land and buildings. What celebrations and trials unfolded in those dwellings? I wish I knew. The history each house has is beautiful, but soon they won't even be standing here to remind us of what has been. I may not know the names of the families who lived in them or when they were built, but they do have a purpose. They are a testimony to time and the past. People may come and go, leaving their imprint on the Earth, but the Earth will always win. We strive as Americans to build our fortunes and holdings, but sometimes fate has different ideas. In this current economy we hear about foreclosures and bankruptcies. Those may be the future disappointed houses. We need to strive in building strong families and relationships, because those who house our ideals will carry them on. I don't want to put all my energy into a disappointed house. I want to pass on a legacy that will grow and weather time. My children, family, and friends are the first place I will start. The next time you drive past one of these disappointed houses, evaluate your goals and dreams. I will have fun this afternoon scrounging in the dilapidated house and, hopefully, I will bring some piece of it back with me. I can clean it, paint it, and give it a second chance in my home. That's the nice thing, each day is a new day with no mistakes in it. (I took that bit from Montgomery, too.) We can dust ourselves off and try again.